US President Trump’s intended pullout from Syria would dump a heavy burden on the Saudis. The Crown Prince plans to go next to Baghdad. Some Washington officials explained that this comment “was not an impulsive thought bubble” as it was treated by some. Trump believes that, after the defeat of ISIS, America has done enough and the time has come for other nations to step in and look after their own security interests in Syria. Some officials say this also explains the president’s decision to cancel a US allocation of $200m for sustaining the local government of northern Syria. They say it was approved by Rex Tillerson, before he was sacked as Secretary of State, without the president’s knowledge and as soon as Trump heard about it, he picked up the phone and stopped the transfer of funds. 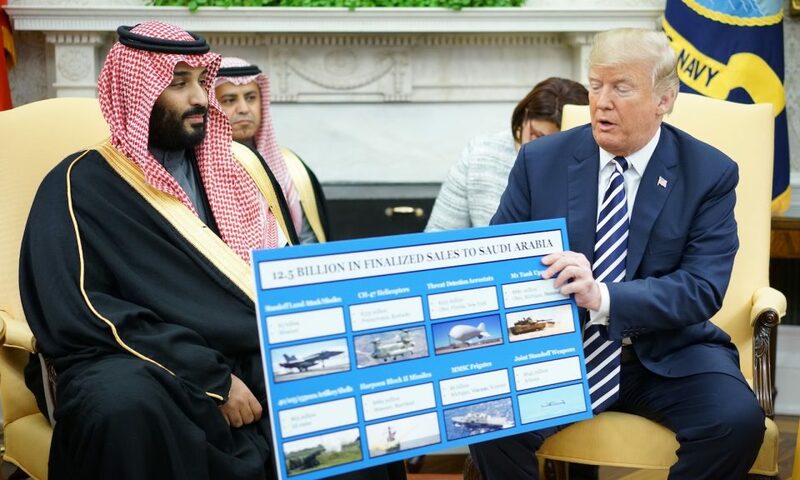 DEBKAfile notes the conspicuous disparity between the US President, who focuses on northern Syria, while the Saudi Crown is concerned about the east. In effect, the latter presumed correctly that Trump means to withdraw US troops from all of Syria. The departure of US forces from its bases east of the Euphrates River would instantly expose eastern Syria to Iranian and pro-Iranian incursions from Iraq and pose a direct threat to Jordan and Israel. President Trump appears to have decided that this should not be America’s problem and that its forces have done enough. It is now up to Saudi Arabia, Israel, Iraq and Jordan to take over. One of the steps in the works in this regard, our sources report, is for the Saudi crown prince to pay a visit to Baghdad and see if he can pull together some sort of front of opposition to Iranian expansion, or, perhaps, persuade Iraqi prime minister Haydar al-Abadi, to send Iraqi troops to the Syria border. For the best effect, the prince aims to schedule this visit, which is still in negotiation, for mid-April, a short time before Iraq’s May 12 general election. For Tehran, a visit by the Saudi heir to the throne to Baghdad as well as the Shiite cities of the south which Iran views as its strongholds, would be an unprecedented provocation and challenge to its prime sphere of influence in the Middle East. Why if Mohammed bin salman visits iraq, this visit could chalenge iran influense on baghdad? He is goodzila? Let us imagine PM Netanyahu being invited and visiting Iraq…. In such a case the ayatollah will surely shiit his pants like a godzilla. In Ezekiel 38, the USA is no where in the picture. “…the merchants of Tarshish, with all the young lions thereof…” (v. 13; Tarshish being Great Britain, the young lions – its ‘offspring’ countries / nations, the US clearly belonging to ‘the pride’). Britain is not dominating U.S. policy for the first time since WW2, but that could change once Trump is out of office. The United States is NOT a young lion. It is an Eagle. We are not a commonwealth and do not show subservience to a queen, sitting on an impotent throne, belonging to a small island off the coast of a contentious continent known as Europe, on our currency. Canada, Australia, (whom Britain all but abandoned in WWII), New Zealand are all young lions and profess as much through their obeisance to Miss Elizabeth on their currencies. She can revoke their commonwealth status at her whim and pull them back into her kingdom. Try that with the red-blooded American commoners over here and you will have a second revolutionary war. Did I say the US was part of the Commonwealth in my original comment? No, I didn’t, as everyone is perfectly aware of the fact. You are doubtless well informed that the US contribution to the Allies victory in WWII was more than meaningful – this is a fact which is impossible to deny and which obviously fits perfectly the concept behind the poster “The Empire Needs Men! The Overseas States All Answer the Call. Helped by the Young Lions the Old Lion Defies His Foes. Enlist Now.” Just look it up if have not seen the thing yet. And it’s all too far from being the only piece of evidence, far from that. Also, please watch https://youtu.be/66is0zWfjJc it’s quite rewarding. More scripture throughout the old and new testament point to Turkey as the king of the north or that particular geographical area as known as Asia minor in past. Turkey is Togarmah as per the majority of historians. The land of Magog, where Gog comes from, is the territory to the north of the Black Sea inhabited in ancient times by “Magogites, whom the Greek call Scythians” (Josephus). Which nowadays happens to be Russia. in Ezekiel 38 the people are tranquil and they live without a wall, and they have no bars or doors. 1. …they perform it, for their hand has the power. 2. …and they oppress a man and his house, and a man and his heritage. 3…. Behold! I plot evil against this family, from which you shall not remove your necks, nor shall you walk erect, for it is a time of evil. 9. …, from her infants-you take away My glory forever. The US is Mystery Babylon and will be destroyed by a coalition of 10 kings (Rev 17:16-17) led by Antichrist. This is the means by which Antichrist takes leadership over the world, by removing the current leader America. (Also Daniel 9:21). This happens, I believe, after the peace treaty (Dan 9:27) but before the abomination of desolation. This is the second trumpet “the burning mountain cast into the sea,” where mountain is always a symbol for leading world government. This anihilation of America is recorded in detail in Jeremiah 50 and 51. The Vatican is the Mystery Babylon of Revelation. Mystery Babylon is a woman who is a harlot; she is a city which sits on 7 hills (Rome is known as “The City of Seven Hills”) and is apparently the headquarters over a vast international system and lastly, “she” is clothed in red and purple (colors of the 2 ruling bodies in Catholic Church). How do you really know it’s America being referred to there ?????? It’s Psalms 83 War coming up NOT Ezekiel war ! No, this means that Saudi Arabia, Israel, Iraq and Jordan will stay out of Syria. You know why. And Iraq is not your ally, oops, what an error you made! its good move by Americans and Anglo Saxons to get out totally , and let the neighborhood settle itself . That includes peace among everyone , whereby , American, Frenchmen and Anglosaxs and their filthy business should be brought rapidly home , since USA soon will have internal war in USA , and Brits will finally get a peace of their own filth and stupidity . Hope that Israel and Syria, and Iran and Iraq and the Lebanon and all the Middle east finally make peace and rebuild themselves .As far as Kurds go , they had autonomy under Saddam , than why they let their American and Israeli supporters topple him? Bad move that will leave them sadly at a mercy of Central Asia and even Russia , that always helped them and even set up for them a little Kurdistan. I believe Trump is pulling out at this precise moment because it will force the Israeli-Arab alliance to emerge from the shadows. With America in Syria there is no need for the Arabs to openly ally with Israel. Trump wants to bring his troops home, but he also wants to leave behind a semi-stable region. The best way to stabilize the region is through an Israeli-Arab alliance. Trump is not the first President to understand this, but he is the first President to have the guts to defy the Globalist pro-palestine State Dept. The Saudi will come away empty handed from Bagdad. Al Abadi and most of Iraq is in Iran’s pocket. ” persuade Iraqi prime minister Haydar al-Abadi, to send Iraqi troops to the Syria border. ” The Iraqi army and the Shia militias ultimately take their orders from Quassem Suleimani. What pipe-dreams! “But I say unto you, That every idle word that men shall speak, they shall give account thereof in the day of judgment” (Mat 12:36). It’s better to leave than be shamefully forced out by Iran and Assad not to say Russia.. US has no possibility of resisting even ASSAD’s forced alone INSIDE SYRIA not to say Iran and Russia. It is how a nation losing its status of the Great Power. You can’t make resolution of the Congress proclaiming the us a Great Power, or have 1 million people brandishing ‘Stars spangled ” banners and placards saying “The US is#1”. The Great Power is a state having sufficient economic, industrial, financial and as a result political and military potential to have a say in a setting, and shaping The World Order to its liking. But once set The World Order must be maintained. In any socium there are individuals who don’t like rules, are trying change it and circumvent. Being a Great Power means to be a policeman. As such you can’t go only after pretty crooks, bicycles thieves, and shoplifters, but tell the people when really bad guys are coming in the neighborhood to manage themselves. They will manage of course without you, without mayor and chief of the police, but it will be quite another order of things. I have no problem with US isolationism, but both US politicians and electorate should better understand that US isolationism means that US opinion and wishes will be of no importance to the rest of the World. Just to note: US isolationism didn’t do us or most of the rest of the world much good when it was our official policy in 1914 and again in 1939! Putin told Trump to get out or he’d release the tapes of the Russian prostitutes peeing on the pervert. From a US perspective, there is nothing worth saving in the Middle East except for Israel. The US has wasted a trillion and over 5000+ lives in Iraq and Afghanistan and what does it have to show? Less than nothing. Obama made sure of that by empowering the Islamic State of Iran, letting it advance its nukes, and allowing Russia to assume the former role of the US. The Saudis are well armed. Years of purchases and training have given it the material they need to do the job but they have no willingness to fight for themselves. They always employ mercenaries or the US to do their dirty work for them. Now they are going to have to step up and confront Iran directly. Israel needs to be even more well supported; not just on the military front but also armed against the EU-UN propaganda which is out to destroy Israel with BDS and other forms of propaganda and support for enemies of Israel. The US should start by telling the EU to go to hell when they seek “investigations” of the recent terror storming of the Gazan border – when the terrorists were killed in the act of violent attacks, the EU and UN automatically came to the defense of the terrorists. Nobody mentioned that the Terrorstinians have no right to the Land of Israel and that Israel belongs to Jews – the EU (and the Pope) are so filled with pro-Islamism that even Europe is up for grabs according to Europeans who want Europe to become an extension of the Caliphate. Perhaps the US should construct the largest base in the world in Israel and that would carny out periodic raids to prevent the advance of terrorism in the region. You can’t just blame obama for Iran’s advancement. You have to blame the Bushes, Clinton, Raegan and Carter too. They all had a part. Yes, but Obama gave them the ways and means to carry out their evil plans. Great idea and your post was so well said! This meeting won’t happen. Iraq wants nothing to do with KSA, the USA, Israel, or any other country that is part of the status quo. Remember, the status quo means embroiling the “Upper Middle East” (countries north of the Persian Gulf), so that oil-as-usal can sail through the Suez Canal-as-usual. This is the status quo that according to its masters, would 1) keep China from investing in such instable zone, 2) keep USA/KSA hegemony on the region and 3) foster the idea of Israel being the only stable democracy in the ME… that can guarantee the safety of the Suez route to keep the status quo unhurt. The only problem its this plan is old, theoretical and out of touch with reality. The reality is that peoples from these targeted countries (and muslims in general), want to take the middle man out of business. They want their gas/oil to flow directly to Europe and Asia. No need for Suez. There is no ‘worry the EU is a nullity matters zero and has not yet understood. When it is with its back to the wall and we miss it little will understand that the US have been syufati to have allies so useless. And then the aristocrats of an old continent will be less decrepit in their behavior and they will understand that I have to accept the Atlantic pact seriously. Understand this will become reliable allies. If they do not understand it they will disappear, the West will do without them who have not even understood that their small countries must join politically or federate and not put behind a fake flag as is the euro. Still regurgitating the same old stuff—————–and doing so completely OUT OF CONTEXT, with no clue as to what it’s really all about (notice the missing sections as edited by iVaN and jumping from one book to another totally unrelated book)! iVaN—————be kind and let the next patient get on that community computer before you wear down the key board with all that typing! Who thinks MBS and FatBoy Avgidor ’69’ at least 3x each week? It is time for the US to pull out from Syria, after all has never been invited by the Syrian government. Can we sell you outdated monkey junk the Russians can easily desroy and the euros would laugh at buying? Maybe too much nursing on the king’s polydactyl digits?